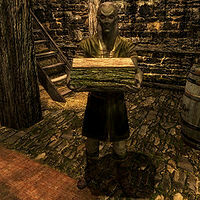 Romlyn Dreth is a Dunmer thief working for the Black-Briar Meadery. He is secretly stealing Black-Briar mead from the meadery, and sells bottles of it for 10 gold each. He will ask the player to deliver a Black-Briar mead keg to Wilhelm in Ivarstead. Completing this task will add him as a potential spouse, and will also make low-level items in Black-Briar Meadery freely available (including many bottles of Black-Briar mead). Romlyn wears a set of farm clothes and a pair of boots. He is equipped with a leveled dagger which can be up to elven quality. He carries two different keys (see notes), three lockpicks, and a selection of common loot and gold. He only knows a single Destruction spell, specifically flames. Under the Table: Deliver a smuggled Black-Briar Mead keg to the inn at Ivarstead. Niluva: "Do you know what Indaryn told me? He said if I'm late one more time he'll kick me right out the door!" Romlyn: "That s'wit. One day, he'll regret pushing all of us around." Niluva: "What do you mean?" Romlyn: "All I'm saying is Indaryn's going to push someone too far one day and they're going to push back... hard." Indaryn: "Romlyn, I've been meaning to speak to you. I did a count at the meadery and we're four cases short... again." Romlyn: "What are you saying? You think I had something to do with that?" Indaryn: "I'm not accusing you of anything. Yet." Romlyn: "The Dreth family doesn't steal, Indaryn." Indaryn: "For your sake, I hope you're right. Because if it is you, and Maven finds out, the Dreth family is going to be one member smaller." Romlyn: "So, what do you think of my plan. You in or out?" Indaryn: "If you think I'd would make a move like that without asking Maven, you're out of your mind. Doing that would be a fatal mistake." Romlyn: "Come on, think about it. She'd reward us!" Indaryn: "If you want to go out to Whiterun and burn that meadery down, go right ahead. And when the guard traces it back here, and Maven is implicated, I'll be sure to tell her it was your idea." Romlyn: "Have I told you about Valen, my dear?" Keerava: "I love when you spin that yarn. Gets better every time you add something new." Romlyn: "He killed six Imperial Guards before they dragged him into the prisons." Keerava: "Was this before or after the Mythic Dawn attacked the Emperor and Valen single-handedly fought them off? Just shut up and drink, Romlyn." He is a descendant of Valen Dreth, and will occasionally tell exaggerated stories about him. If you turn him in to Indaryn for embezzling, he will say: "A Dreth never forgets a traitor!" He will continue to sell discounted Black-Briar mead should you choose to marry him. Romlyn carries two different keys; Romlyn's house key and key to Romlyn Dreth's house. The first one unlocks the door to his house in Riften, while the second one doesn't appear to open anything in the game. Version 1.2.4 of the Unofficial Skyrim Patch removes the extra key from the game. This page was last modified on 16 April 2015, at 00:00.